The Acropolis of Athens is one of the most famous places on earth, visited by over a million people every year, and instantly recognisable by millions more who know it only from pictures. With posters and postcards displayed in every street kiosk and hotel lobby in Athens, and countless images encountered in books, films, television, brochures, advertising, and social media in countries round the world, it must now be impossible for any visitor, whether a Greek child on a first educational visit or a stranger from a distant land, to look at the Acropolis without feeling that, in some sense, they have already seen it. Nor is the sense of immediate familiarity a recent or an incidental result of the rapid spread of modern information technology. Already by the end of the eighteenth century, the number of people who knew the Acropolis from pictures was greater than the number, whether local people or visitors, who saw it with their own eyes, and the gap continued to widen. Partly as a result, thoughtful visitors have long been worried about loss of independence. 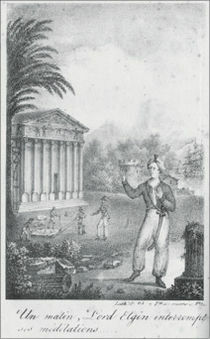 Colonel J.P. Barry, a medical man, for example, visiting the Acropolis from India in 1905, hoped to experience ‘impressions not derived from reading’, claiming that: ‘The most valuable impressions for the traveller are those he makes his own not those made for him’.Joseph Pennell, an artist from the United States, who in 1913 wanted to experience Greece without preconceptions, declared that before his visit he avoided reading any classical author even in translation, and deliberately refused to take any interest in architecture or proportion. They and many others before and since have understood that, whether they chose to submit, to resist, or to negotiate, and whether in the event they were confirmed or ‘agreeably disappointed’ in their expectations, the seeing agenda had already been set. 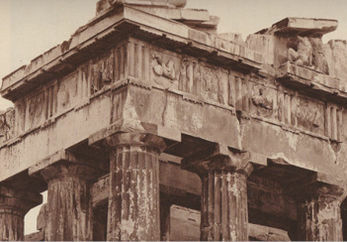 In many of the issues that have arisen in the development of modern notions of cultural property, including law, legitimacy, identity, history versus heritage, stewardship and trusteeship, appropriation and restitution, the Acropolis of Athens and its buildings (including the parts of the buildings removed by Lord Elgin) have provided a framework for understanding the changing issues. Continuing in that tradition, and as a potential contribution to the wider aims of the volume, I offer in this essay a summary history of ways of looking at the Acropolis and how and when they were constituted, from which some of the contemporary ethical questions emerge. There can be no other monument in the world in which the potential long view is so long, the ways of seeing so different across time, the claims made so varied, and the evidence available for developing answers so complete. Two general observations underpin everything that follows. First, without viewers, the Acropolis is a culturally inert accumulation of animal, vegetable, and mineral – and even these are categories invented and imputed by human observers. It is the man, woman, or child who looks at the Acropolis who confers the value and makes the meanings, not the Acropolis as such. And, secondly, the transformation in the mind from the physiological act of seeing to the psychological act of interpretation cannot occur unless the experience has been mediated. Any act of looking at the Acropolis, I take as established, has required decisions on the part of the viewer, not normally consciously or explicitly taken, about the organising categories within which the seeing experience is to be understood. The situation today, when all on-the-spot seeing has been prefigured, is only one example of a cognitive process that, we can be confident, has occurred at all times in the past, including during the centuries when there were no pictures and hardly any written words. Even those viewers about whom we know least, such as women and girls forcibly brought from distant alien cultures and immured in the Acropolis as slaves, brought their own interpretative categories, even if it may now be impossible to recover what they were. And, at the other end of the spectrum, I could give long lists of men and women whose sincere accounts of their experience of looking at the Acropolis conform so closely to the conventions of their cultural group that it is impossible to tell from their words alone whether they ever really saw what they describe. Writings, Phaedrus, have a strange quality in which they resemble portraits. They stand before you like living things, but if you ask them a question, they preserve a solemn silence. And it is the same with written words. They seem to talk to you as if they had minds, but if you ask them about what they say, from a wish to understand them more fully, they go on telling you the same thing for ever. The Acropolis, our generation can readily agree, does not converse, but, with all respect to Socrates, we also know that it does not speak, let alone that it goes on telling the same story forever. The aspiration to ‘let the mute stones speak’, a proverbial phrase since ancient times, ignores the inescapable fact that no meanings exist in stones, nor indeed in any of the other material remains of the past, until they have been imputed by live human beings applying their own categories. The belief, associated with western romanticism, that great art can transcend its cultural circumstances and material conditions and offer timeless truths direct to the minds of viewers, is itself a mediating category, as historically contingent as the others. The eye, except possibly in newly born babies, is never innocent. Contemporary neuroscience discusses the operation of visual cognitive processes in terms of ‘saccades’, the eye movements that occur several times every second, and ‘salience’, the value that the mind attaches to the visual stimuli received, and the reward it hopes to receive by targeting its gaze. The assumption, mainstream until recently and still commonly held, that the act of viewing is a passive receiving of information, has been replaced by an understanding that viewing implies choice. Other assumptions about the ways in which the external world is understood, often categorised as ‘natural’, ‘god-given’, or otherwise essentialist or unchanging, that have in past epochs underpinned both the visual production and the consumption of the Acropolis no longer deserve our assent. For centuries, for example, it was generally believed, officially taught, and acted upon, that the human eye sends out light rays to touch the object of vision and returns, bearing the essence of that object. During the centuries of the iconoclasm controversies among competing Christian groupings in the Byzantine period, Athens and its acropolis were part of a society in which theories of anatomy, optics, the nature of light, and what happens to the mind in the act of looking, that have long since been proved to be fallacious, led to many violent deaths. Or, to give a more modern example, when William Hugh Williams, a landscape artist who saw and drew the Acropolis in 1817, and who became known in his day as ‘Grecian’ Williams, wrote of the ‘electrifying truths, which flash upon the mind in studying her [‘Nature’] not only as she is, but as seen through the medium of works of genius’, he was repeating a cliché of his time that few can now accept. Nor is his assumption that the natural world is designed and benevolent one that can now be accepted. Our generation can also bring to a history of looking at the Acropolis a modern appreciation of the difficulty of separating mental and bodily states. Emotions engaged by seeing experiences, it is now established, can lead to changes in and beyond the mind/brain, such as a sense of enhanced intensity, which may be mistaken for a confirmation of the validity of some opinion that the viewer already holds, whether of admiration or abhorrence. Dreams too have often been categorised as ‘epiphanies’ or ‘prophecies’, messages from supernatural beings or forces, that encourage the wakening dreamer to think and act in certain ways. Viewers of the Acropolis, acting on such beliefs, have in modern as well as in ancient times sometimes deliberately put themselves into a semi-conscious state in order to experience responses that they believed arrived from outside, and have frequently been encouraged to do so by those who have wished to influence them. Memories, we can, I suggest, now accept as having been established by the work of Halbwachs and his successors, exist in relationship to a social group, situated in the mental and material spaces provided by, and often invented and maintained by, that group in order to enable them to be organised and conserved. Besides functioning as a theatre of social memory, the Acropolis has itself been a technology of memory both for attempts to invent and control new memory by building and rebuilding, and for policies aimed at destroying and superseding the previously existing memory by knocking down, replacing, and what we may call monument cleansing. To those living in modern and in ancient times, but to a much lesser extent during the long millennium in between, the Acropolis has served as a store of cultural capital. When UNESCO, the organisation that was established in 1945 in the ruins of the world war, to promote peace ‘on the basis of humanity’s moral and intellectual solidarity’, took the Parthenon as its symbol, it was picking up and reinforcing a tradition of regarding the building as more than an extraordinary survival from an ancient civilisation or as a fine work of architecture. Unlike, say the Pyramids of Egypt, the Acropolis of Athens has in recent centuries been presented, within the western political and artistic traditions, as an inspiration to the modern world, part of a precious identity shared with classical Hellas. And the imputations are themselves part of the history. As a material embodiment of immaterial values that many since the European Renaissance have wished to claim as their own, the Acropolis has provided a focal point for many of the intellectual – and occasionally of the physical – struggles from which the modern world has emerged. If there is a shared western identity, the Acropolis of Athens has participated in the debates and crises that have helped to shape it. Indeed, with its hold over the mental worlds of memory, myth, and fantasy, the Acropolis of the imagination has sometimes played as decisive a role in the course of events as the Acropolis of the stones. A history of looking at the Acropolis that aims to address the implications of the two starting observations within a framework of established modern knowledge must therefore, I suggest, do more than add new information to the existing histories of the Acropolis as a monument, modifying the accounts and explanations as necessary, although it must try to do that. Nor can it be content with finding examples of people who saw the Acropolis at different times, and summarising what they are reported as saying or thinking or feeling, although it should build up this kind of historical data too. A history that pursues the implications of the two observations within a framework of established modern knowledge must, I suggest, also investigate the means by which the experiences of cultural constituencies were turned into categories, and how, by whom, and on whose authority, these processes of inscription, repetition, and ritualisation helped to establish and mediate ways of seeing, and how, when, and why changes occurred. Although seeing is individual and dynamic, the mediations that condition expectations, and the choices about salience, are social and often stable for long periods of time. And since the mediating, both the immaterial, such as cultural norms, and the material objects, such as the books and the pictures by which norms were constituted, could only have influenced those who already knew their languages, conventions, and genres, it follows too that questions about the nature and extent of the materiality of mediation, including the political economy of how they came into existence in the form that they did, who had access to them and when, and who assented to them or resisted, must also be part of the inquiry. Until recently, the historic, as distinct from the implied, viewer has been largely absent from art history as practised, or has been conceived of as ‘a passive reader or consumer of images’. However, when we try to build a provisional model for conducting an inquiry into the history of the Acropolis as a dynamic cultural system – that is, as a series of transactions rather than as a changing text – we quickly find that the determining role of the mediations cannot simply be attached to the current conventions, leaving them otherwise unchanged. No historic viewer of the Acropolis, has, for example, ever followed the conventions that present the Acropolis as a chronological parade. A history arranged as a series of moments of first production is unable to accommodate the fact that the monuments of the Acropolis were designed and built so as to be seen into the future as it was then foreseeable, and that they often did continue to be looked at for centuries. It has become common, by those aware of the difficulties implicit in periodisation, to describe the continued existence of public monuments after the time when they were first built as their ‘afterlife’ from the German nachleben. But the word itself draws attention to its own lack of historicity. Except possibly (and to a limited extent) in the case, for example, of the first viewers personally present at the unveiling of a public monument, when the producers and the consumers were members of the same closely defined cultural group, we cannot assume that even broadly contemporaneous viewers categorised, interpreted, or responded in the same way. Since all monuments are attempts to influence viewing experiences beyond the moment when they were first made, their ‘afterlife’ begins the moment they are born, or in many cases even earlier. Nor have viewers of the Acropolis always, or even normally, privileged the immediately contemporary over the old, nor regarded the no-longer-new as being culturally no longer alive. Most visitors today look more closely at the Parthenon than at the ticket office. What we can say with confidence is that the producers of the material Acropolis – walls, buildings, public and private dedications and inscriptions, sculptures, pictures, and symbols – have always wanted it to carry visual signs to live viewers, actual and potential, with the hope, intention, and expectation that meanings made by these viewers would be accepted, internalised, and acted upon. Indeed a wish to offer viewers a means of understanding the relationship between the then present, the then past, and the then future, was among the explicitly stated aims of those who built the classical Acropolis and by others later. And there has never been a time from the present back to classical times and earlier, when viewers did not see ruined as well as functioning buildings, and attempt to draw lessons from the experience. A study that faces the implications of the two observations is therefore, I suggest, certain to be different from a history (or an art history, or an archaeological history) of the stones, and cannot be derived solely from such histories. The theories and mediations, that coexisted and competed, form complex time patterns of their own that do not coincide with one another, let alone with the conventions of a chronological parade. When, however, we relocate the site where meanings are made to the minds of viewers, and admit them as active participants in a complex dynamic system, we may begin to undertake the more ambitious task of tracing the effects of cultural production through to cultural consumption, to the resultant construction of group mentalities, and on to real world consequences in at least some cases. The fact that there are mismatches between current and past ways of seeing is, of course, well understood, as is the difficulty of the imaginative leap needed to emancipate even the recent past from modern assumptions. The Past is a Foreign Country was the title of one of David Lowenthal’s pioneering studies of the notion of heritage published in 1985. For more than a generation, scholars have rightly emphasised the need to recover and historicise past discursive practices, including ways of seeing, that were based on assumptions that have since been rendered untenable. My approach may meet the comment, associated with post-colonial theory, that I am imposing modern western European scientific and Enlightenment categories on societies whose world views were different and who valued different kinds of knowledge. In recent times, for example, some have re-conceptualised the notion of myth as ‘meaningful history’, an attempt to soften the distinction between a search for reliable knowledge of what actually happened in the past from a search for understandings of how the mediated past impinged on the minds of the people alive at any particular time. 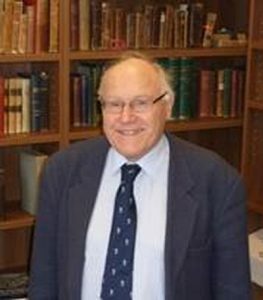 However, although assessing the past within its own discursive terms may appear to protect the modern historian from the charge of condescension, it risks turning history into a mere collecting and chronicling of past stories that we now know to be untrue, an antiquarianism condemned to perpetual imprisonment within its own artificial conventions. Preferable, I suggest, is to find a way that neither ignores the otherness of the past, nor adopts the reactionary fallacy that modern scientific and Enlightenment knowledge is just another passing discourse whose claims are no stronger than those of its many predecessors and modern competitors. Nor need such an approach accept a relativist position that all the pasts of the Acropolis are, or should be regarded as, of equal interest to the present day, what Werner Jaeger, the champion of the unique value of Hellenism, despairingly called ‘a night in which all cats are grey’. Rather, while accepting that my approach is inescapably a product of my time, as well as an attempt to escape from it, I would say that recovering a critical understanding of the succession of pasts and how those who inhabited them understood their own pasts and possible futures, can both lessen the risks to our intellectual independence and improve our understanding of our present situation. Men make their own history, but they do not make it just as they please; they do not make it under circumstances chosen by themselves, but under circumstances directly encountered, given and transmitted from the past. The tradition of all the dead generations weighs like a mountain on the brain of the living. In the approach that I adopt, broadly counter-chronological with detours, I propose to excavate the conceptual and organising categories that were applied in various pasts, in the hope of discovering how they came into being, were circulated, modified, subsequently overlaid, and sometimes acted upon. In re-imagining the past, it may be safer to move in steps from one layer back to its immediate predecessor, thus developing an incremental understanding of how the imagined past has come down to us, than to risk making a single large leap from the here and now. Indeed the history of modern attempts to understand ancient Hellas is so replete with examples of cultural constituencies projecting back their own ideologies that it would be possible to read it as a set of reminders of the risks. Although concentrated on one specific object, this essay can therefore be taken as a response to Michel Foucault’s call for an ‘archaeology’ or a ‘genealogy’ of knowledge, remembering that Foucault was not a theorist qua theorist, nor an ideologue, but a thinker whose ideas were founded upon his historical, critical, and Enlightenment-inspired attempt to understand the otherness of the past, including ancient Hellas. For such a study, the Acropolis of Athens offers some unique advantages. Indeed it is probably only the presence of these unique advantages that makes a project with so many factors and feedbacks potentially feasible. Firstly, the record is unusually full and long. From the time when the Homeric poems were composed and recited (eighth or ninth century BC), and probably long before that, there have been many people living far from Athens who knew enough about the Acropolis to recognise allusions in both epics. And there have been few times since then when some knowledge of the Acropolis has not been passed far from Athens across time and distance by word of mouth, by oral literature, by writings carried in manuscript and print, and by other media. And besides the direct reports of those who actually visited Athens, we also have many writings that were composed and promulgated in an attempt to influence ways of viewing. Admonitory writings, provided we read them as indications of recommended ways of seeing, stories that attempt to make the mute stones speak, rather than as examples of records of actual individual experiences, are a major resource, especially for the long periods of time when we have few others. Indeed for the task of recovering mainstream ways of seeing, the clichéd, the humdrum, the derivative, and even the fake, are particularly useful, and fortunately they are abundant. Since the sources, although plentiful, are at all epochs heavily weighted towards those produced by males from the richer socio-economic groups, we are put on our methodological guard against arguing from the anecdotal to the general. Paradoxically, among the constituencies who have been largely lost from the record are the people who spent much of their lives within the Acropolis precincts, such as the men and women who looked after the buildings and serviced the rituals, the soldiers of the garrisons, and their women and slaves. A second huge and specific advantage is that, as an object of study, the Acropolis constitutes its own visual and interpretative frame. Some of the locations in and around Athens from which viewers have chosen to look at the Acropolis, and from which artists have presented their pictures, the – using a term adopted by Adam Smith – ‘viewing stations’ were consistent for centuries, and we can be confident that it was to influence the seeing experience of viewers standing on these stations that the built Acropolis was designed during some epochs at least.91 The Acropolis matches the classic definitions of landscape pioneered by J.B. Jackson and W.G. Hoskins as ‘a portion of the earth’s surface that can be comprehended at a glance’, but also as a text that is open to be read, and as a dynamic cultural process by which, by selective emphasis and exaggeration, human identities are constituted. Like a literary text in a book, or a painting hung in a picture gallery, that is as an object of view already boundaried, the Acropolis can therefore be read, both historically, within past contexts, and critically in accordance with whatever modern criteria we may choose to apply. A third specific advantage is that, throughout its long history, the Acropolis has always been an officially controlled site. 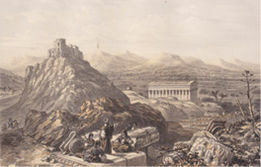 The legal as well as de facto ownership of the Acropolis, recognised against the legal norms of each epoch, including right of conquest and treaty of surrender, can be traced back, through a succession of suzerainties, to ancient times more or less continuously from 10th of April 1833 – the day when it was handed over to the government of the recently established Greek nation state, and its modern history began. Apart from occasional catastrophes of earthquake, fire, sacking or bombardment, every substantial change – whether the first flattening of the summit, the clearance of caves or the vegetation, the building of temporary barriers and walls, the digging of pits, the design and the placement of fortifications, buildings, statues, and inscriptions, as well as their later removal – has required the approval of the authorities then in control, including those whose occupation was short-lived. Removals from the site, of which there have been many, have also required approval. 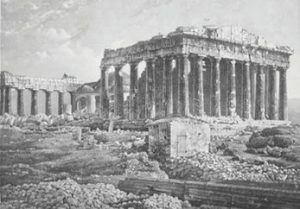 In considering how changes to the appearance of the Acropolis came about, the study need not therefore be thrown back on, or restricted to, notions of cultural emergence or emanation, that equate the minds of viewers with those of artists as expressed in their production, and is liable to fall into circularity and romanticism. It is legitimate to discuss the whole history of the Acropolis, including the classical Acropolis, in terms of the aims, intentions, and hopes of the successive producers of its appearance, including the theories of cognition and of art and iconicity that influenced their decisions, without of course assuming that they were always successful in their aims. Because the sources are so rich we are also able to recover the political regulatory and the economic processes that brought about the material Acropolis in various forms at various epochs. In addition to the cultural agendas we can recover the formal administrative processes by which approvals were given and projects financed (including by slave or forced labour) and then executed and accepted. Introducing the political economy component brings out the extent to which the determining decisions about the appearance of the Acropolis, and often also how it should be mediated in words and pictures, were taken not locally in Athens, but in ancient Rome, in Byzantine Nicaea and Constantinople, in Ottoman Istanbul, and in the capitals and other cities of modern western countries. Moreover decisions were often made or influenced by governments and international authorities and agencies, whose agendas did not necessarily coincide with the wishes of the local people of Athens, insofar as they are knowable. With the exception of the classical period, almost all the written and visual works on which we are reliant for a history of looking were not produced locally in Athens, and even in the classical period many of the most famous writers, such as Aristotle, came from elsewhere. The thought, still heard occasionally, that you have to be Athenian to understand the Acropolis, that implies an essentialism of nationalism, is especially out of place for a monument that has, for most of its history, been culturally constructed far from Athens, and that, even in the classical period, counted a wish to influence non-Athenians among its explicit aims. Among the producers of the Acropolis, I therefore include the proposers and the instigators, the political and other institutions who voted the funds, the designers, engineers, architects, artists, skilled and other workers, whether forced or voluntary, both those who built and those who destroyed, replaced, adapted or altered. Among the producers I also include the intermediaries who composed, made accessible, and published visual representations, and those who attempted to regulate or influence the viewing experiences of others, such as political (including religious) leaders, authors and educators. Among the consumers, I include both those who saw the Acropolis directly with their own eyes and those who encountered it from a distance in images and words. So let me begin the dig by offering a photograph of the Parthenon today, probably the most valued view of the Acropolis in recent times. 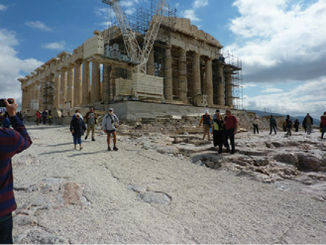 Figure 5.1 shows a view of the Parthenon that at the time of writing opens up to the visitor arriving on the summit and following the tourist path. The pictures I show are mediations of mediations, and this offers advantages as well as potential losses. 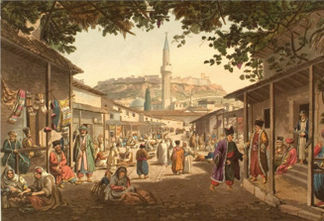 The once clear air of Athens, that was uniquely well captured by the technology of coloured aquatint, is now made even clearer when seen with the computer light behind in the online version. And we can use zooms to improve our appreciation of how visual technologies achieved their effects. Fig. 5.1 The Parthenon from the north-west. This is the temporary, constantly changing, Parthenon that visitors encounter and have encountered during the recent decades of conservation. 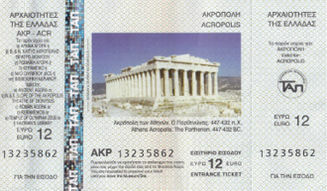 It coexists with images of the timeless Parthenon, shown without scaffolding or people, that appears on the entrance tickets given to visitors, as shown in Figure 5.2. Fig. 5.2 The Parthenon from the north-west. It is, almost without exception, the timeless Parthenon that is reproduced in the postcards, on the covers of guidebooks, and in the windows and frontages of the shops and kiosks that surround the Acropolis, and elsewhere. A periphery of iconicity, we can say, pre-sets the Acropolis viewing experience before visitors reach the site. And although there are occasional grumbles that the conservation works are taking too long, contemporary viewers appear to have no difficulty in cognitively negotiating both images simultaneously, eliding the scaffolds as easily as they elide the other apparently temporary, but in reality permanent, modern fixtures that they see on the Acropolis, such as the lamps for floodlighting. And just as the principles of the Venice Charter on the conservation of monuments, with which the recent Acropolis programme conforms, requires that viewers of the Acropolis buildings are able to distinguish the ancient marble from the new used in repairs, that is, to operate simultaneously in two temporalities, they also operate simultaneously at different levels of cognition, seeing the actual stones, imagining what has been lost, and often also according the experience some wider signification and meaning.93 In Figures 5.3, 5.4, and 5.5, I trace the view back through the era of photography. [LEFT]: Fig. 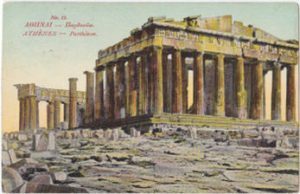 5.3 The Parthenon from the north-west, c.1909 before the re-erection of the colonnade in the 1920s. [RIGHT]: Fig. 5.4 The Parthenon from the north-west. Fig. 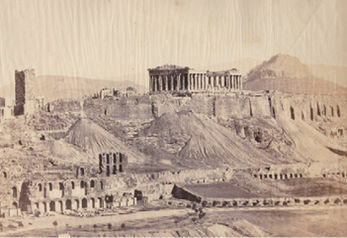 5.5 The Parthenon from the north-west, autumn 1839. 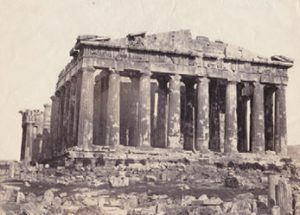 Figure 5.5 reproduces the first picture of the Parthenon made directly by the technology of light on a chemical plate without artistic intervention, although since the daguerreotype camera produced only one copy it had to be copied by an engraver. It shows how the lens of the camera made central the little building that the salience of the selecting eye of a human viewer elided or ignored. The building was physically removed soon after. The image reproduced as Figure 5.6, frequently re-engraved for half a century, accompanied The Travels of the Younger Anacharsis in Greece, the book on ancient Greece that was most often encountered in all the main languages across western Europe and elsewhere from 1788 until into the age of photography and beyond. Fig. 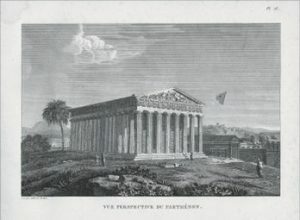 5.6 The Parthenon as it appeared in antiquity, as imagined in 1788. Since the 1830s, the actual Acropolis has gradually come to match the engravings of the eighteenth century whose artists imagined how the Parthenon appeared in antiquity. It derives from the explicitly stated aim of those who, in 1834, decided that the four principal ancient buildings should be visible from all sides. They regarded the buildings primarily as free-standing works of architecture – rather than as a complex of stories in stone in which the official memory and values of the ancient polis had been visually presented and around which they had been ritually performed. And it was not only the Parthenon as a building that was iconised but an interpretative frame that excluded just as it included. We also see that the net effect of the successive conservation interventions till now has been, step by step, to make the real Parthenon resemble the Parthenon as imagined in the eighteenth century. The most recent interventions, such as the introduction, for conservation and tourist-management purposes, of the roped-off concrete path shown in Figure 5.1, have helped to entrench that way of seeing the monument even further. Figure 5.7 reproduces a view of how the Acropolis summit looked when there was still a town on the summit, the Acropolis, taken from an imagined viewing station that was not available, except to birds. Fig. 5.7 The Parthenon from the north-west, c.1805. 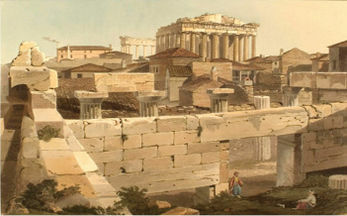 The modern view of the Parthenon only became available when the town was removed in the nineteenth century. In this clearance the unsculpted marble, stones, and tiles, almost everything that could be recycled as building materials, was sold and are now spread through modern Athens. Enormous quantities of earth, and the remains of eight thousand years of human and animal occupation, several metres deep, were dumped over the walls on three sides as shown in Figure 5.8. Fig. 5.8 The Acropolis south slopes around 1858. The present Acropolis summit, we can say, is a triumph of science and archaeology, but it is also the result of a quite narrow way of viewing that looks at ancient architecture, and even at ancient architectural sculpture, as discreet ‘works of art’, with insufficient regard to cityscape, context, or function. One point about the recent conservation programme has, in my view, not been sufficiently appreciated. 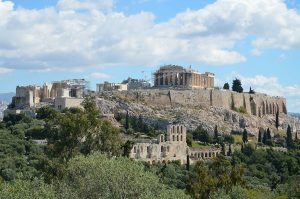 Without fanfare, the ancient path that circles the Acropolis on its slopes, long cordoned off with fences and barbed wire, has recently been reopened. Visitors can now visit more sites, both natural and man-made, look at more vistas, and experience more ways of seeing both directly and in their historical imagination, than have been possible for half a century or more. 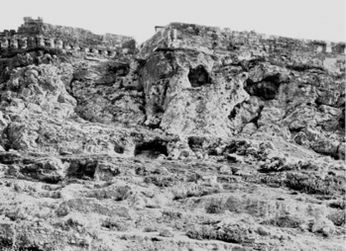 The old photograph reproduced in Figure 5.9, taken when the Acropolis vegetation had been temporarily scrubbed out, records a view of part of the ancient path that is no longer so clearly available. Fig. 5.9 The ancient path on the north side under the caves. To the viewer looking up from the old town, as well as from distances far beyond to the north, the row of column drums built conspicuously into the defensive summit walls, still catches the attention. They are among the remains of the pre-classical buildings that were destroyed by the Persian invaders in 480 BC. The Athenians of the classical age and later looking up from the centre of town, the agorawhere much of the daily life occurred, encountered every day this permanent reminder of the foreign invasion that had once destroyed their material city, but not the real city, the people. It was the remains of the older, destroyed, Parthenon that they mostly saw in their daily lives, not its classical replacement that lies outside the sightlines from the town on this side. The path round the slopes was not an informal track beaten through the vegetation made by generations of trespassing feet, although there are some of these too. Cut into the rock the path was a designed and engineered feature of the Acropolis and of the cityscape that, we can be confident, must have been officially approved and financed by the city’s authorities at some moment in the remote past. Visually, as was noted by Aelios Aristides in his panegyric of 155 AD, the road that circled the acropolis of a Hellenic city was like a jewelled necklace, that unified as well as adorned. Inside, until the nineteenth century, many caves were brightly coloured and lit. The acropolis of Smyrna, a colony of Athens that followed many of its customs, was according to Aristides, laid out like an embroidered gown, another comparison that reminds us that women were included in the metaphors, as well as in much of the iconography, of the ancient city. Also visible from the town, and now visitable, is the Cave of Pan. Figure 5.10 shows the present view looking out over the ancient agora, with the Hephaisteion in the distance. Fig. 5.10 The cave of Pan on the north slope, looking out. It was here, as the story was retold by Euripides, that Creusa was raped by Apollo and to here that she secretly returned to give birth. Pan was given the Cave by the Athenians as a reward for spreading ‘panic’ among the enemy at the battle of Marathon, but as we know from the satirist Lucian, he did not much like it. It was noisy and cramped as I can confirm. The Athenians occasionally killed a goat in his honour, inappropriate, Pan thought, for he was half goat himself. No wonder, as Lucian tells us, Pan hated paying the tax as a non-domiciled resident, a non-dom. On the ancient path, visitors can now stand on the exact spot where in classical Athens the young male Athenian citizens under military training took their oath to defend the city and what it held sacred, and to increase its power.21 They can share the vistas across to the surrounding mountains and seas that visually enclose the territory within its natural amphitheatre, confident that most of the famous men of classical Athens, whether poets, playwrights, philosophers, historians, or politicians, once stood on this exact spot, regarding themselves at that moment as citizen-soldiers. Standing in ranks with the steep Acropolis crags at their backs, the young men were obliged by the steepness of the Acropolis slope to look forward and outward, and to hold their ranks without jostling, as they might soon have to stand in a real battle. Many rituals began on the slopes where the view was outward and unlimited to the horizon, before moving to the summit where the view is inward and confined. In ancient drama too, comedy as well as tragedy, the Acropolis slopes and the horizons of mountains and sea were always in sight, with many of the best known ancient stories, such as those surrounding the families of Orestes and Oedipus, firmly anchored to the visible landscape, both close up, and to the mountains and seas on the horizons. The Acropolis summit, especially now, is a place of imposed order, a clean, bare, enclosed, controlled environment of straight lines, built by human hands, where the natural world is unwelcome – every sprouting plant is immediately weeded out. In ancient Athens, the paths and the caves of the slopes were also integral to the ceremonial, ritual, and formal life of the whole city, important to the cults favoured by non-citizens and slaves of both sexes as much as to those of citizens and their official wives and daughters. The peripatos too, a word that brings out the role of the path as a place for peripatetics, performed social functions beyond its usefulness as a road along which to move from A to B. As an unsupervised meeting place, it allowed, for example, political conspirators and transgressing lovers to escape inquiring eyes. As Lucian reports, Pan used to say that he had a thing or two he could tell about what he saw from his cave after nightfall. A modern psychologist might look on the Acropolis as a layer of conscious human rationality resting on an unconscious swirl of dreams, desires, and fears. Today I think it is fair to say that the dominant way of looking at the Acropolis is as an archaeological and art-historical site. But it is also often invested with modern political messages. That the Acropolis celebrates ancient Athenian democracy is often presented as a fact — Athens as the birthplace, or the cradle, of democracy, the political ancestor of modern democratic nation states. When we dig down through the layers, however, we find that this imputation is seldom made before the mid-nineteenth century. 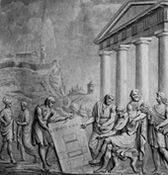 From the epigraphic evidence of over forty cities it now appears that, in the classical period, Athens was not unique in having a democratic form of government, nor was Athens the first. And although the Parthenon was commissioned during the century when classical Athens was governed by a democracy, albeit one confined to male citizens, there is little or nothing democratic in the iconography of the buildings, that, as throughout the Hellenic world, present traditional scenes from local and pan-Hellenic myths as was the convention long before the democracy began and continued after it had gone. Another political way of looking at the Acropolis is to see it as a monument to the continuity of modern Greece back to ancient Hellas. In the recent book prepared by the experts who managed the Acropolis conservation programme, the point was put in the form of a question: ‘Why is it that Greeks regard these monuments as being theirs, regardless of whether or not they visit them regularly or whether they really know them? Why do they regard them as their very own, their “home”, the trademark of Greece through the ages and of the present day?’ This way of looking appears to be no longer much emphasised in Greece itself, being for example, largely absent from the official educational programmes for Greek children visiting the Acropolis. One of the clearest statements can be found in the speech of Melina Mercouri of 12 June 1986, when as the Minister of Culture, speaking in English, she addressed the students of the Oxford Union in England: ‘You must understand what the Parthenon Marbles mean to us. They are our pride. They are our sacrifices. They are our noblest symbol of excellence. They are a tribute to the democratic philosophy. They are our aspirations and our name. They are the essence of Greekness’. Like many nation states, in the nineteenth century Greece produced a series of long, often learned, and apparently authoritative, histories that, by mixing historical fact, myth, ideology, and some self-congratulation, gave a unified narrative to the imagined community of ‘the nation’ as a metaphysical entity continuing in its essentials unchanged across time and situation. 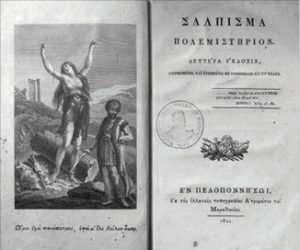 The historian Constantinos Paparrigopoulos, for example, in his six volume work, first published between 1860 and 1877, commented on the long period between modern and ancient Hellas: ‘The city of Athens still preserved its ancient traditions, its love of beauty and reverence for the masterpieces of art … These descendants of the Athenians of the age of Pericles had indeed forgotten how to cultivate literature and the arts, but they had preserved the nobility of their race, and although they had lost its intellectual force, they retained its reverence for all that stirred the enthusiasm of their ancestors’. Despite much searching in recent decades, however, no-one has found any evidence for the local Christian Orthodox community before the Greek Revolution associating their own identity with the ancient ruins before the 1790s, and that was under influences from expatriates. Nor is this surprising as the last thing a theocracy wants is democracy, especially when it is associated – as it was in ancient Athens – with open intellectual debate. An example of the transplanting of philhellenism into Greece, where it has since become native, is shown as Figure 5.11. Fig. 5.11 Greece, invoking Homer and the ruins of ancient Hellas, calls on Europe for help, 1821. Without implying that they are invalid just because they are historically contingent, we can note that all the main contemporary ways of looking at the Acropolis, the archaeological, the art historical, the romantic aesthetic, and the political, were invented and introduced during the last two centuries. Within a few years of the advent of photography, more images of the Acropolis had been produced and distributed than in all previous millennia put together. The photographers, while purporting to offer images that are direct analogues of reality (‘the camera cannot lie’), that the photo-chemical technology appears to guarantee, soon adopted the techniques of fashion, advertising, opera and cinema, to produce imagined but unseeable images, using long ladders and special cameras to shoot from viewing stations that never existed in modern or ancient times. Figures 5.12 and 5.13 are examples of these images, icons of icons, a vision of an Eternal Greece produced for a global viewership. In ‘Eternal Greece’, there are usually no people, nor any clues to when the images were made. By eliminating contingency, they eliminate time. Some, such as the example in Figure 5.13, are deliberately archaised. [LEFT]: Fig. 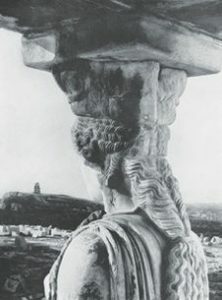 5.12 Caryatid looking towards Philopappus, 1929. [RIGHT]: Fig. 5.13 North-west corner of the Parthenon, 1923. The makers of the modern Acropolis were not only the archaeologists and engineers, but the photographers, publishers, and postcard makers who presented an incorporeal Acropolis, hovering between realism and iconicity. Pan, incidentally, Lucian tells us, complained that, as a plain country god from the Peloponnese, he could not understand words like ‘incorporeal’ that he often overheard in his cave wafting up from the philosophical academies. It was a word that the satirist knew would always raise a laugh at the expense of the philosophers. In Timon, for example, Lucian has the plain-speaking Zeus complain about the philosophers that: ‘One must sit with one’s ears plugged, if one does not want the drums of them cracked; such long vociferous rigmaroles about Incorporeal Things’. In the eleventh century a small Byzantine Christian church, dedicated to ‘the Incorporeals’, was built alongside the grand Roman ruin of Hadrian’s Library, in which the ancient philosophers had stored their books and conducted their classes in specially designed rooms. The word may have been a Christian attempt to appropriate an ancient word still associated with the locality. Modern coexisting ways of seeing are caught by the image at Figure 5.14. Fig. 5.14 Viewing the Acropolis, c.1898. This image, that itself has the clarity of a photograph, is probably copied from a photograph of a painting which had itself been composed from photographs rather than from a personal visit by the artist, and there is no viewing station from where the scene could have been seen. A product of illusory realism, the image picks out some of the main ways of viewing since the clearances. We see a western officer, such as Colonel Barry with whom I began, with his ladies, taking charge with his pointing arm. The elderly Greek, one of the former soldiers employed as guards, is lost in his own, possibly philhellenic, thoughts. We see an artist, and a man reading – maybe an ancient author or an archaeological guide-book. And in the background we glimpse another man looking up, who may be internalising Eternal Greece. The lady who rebelliously breaks away represents the viewers who throughout the ages have resisted the mainstream conventions. Working down to the eighteenth-century layers before the Greek Revolution below we find ways of viewing that were very different. Figure 5.15 is a view of the Acropolis as seen from the town. Fig. 5.15 The Acropolis as seen from the centre of Athens, by Edward Dodwell, c.1805. Although Athens was then a town of only about six to ten thousand inhabitants, it contained forty churches, over eighty chapels, and eleven mosques. By its religious buildings, Athens visually presented its political and social organisation into religious communities, the majority Orthodox Christians and about a quarter Muslim. There were also a few hundred Africans. A visitor to Piraeus in 1809 saw only two ships in the harbour, one exporting antiquities for Lord Elgin, the other importing slaves from Africa. To the surprise of western architects, the classical buildings on the Acropolis mostly lay outside the sightlines from the town. It was only from a distance that the Acropolis appeared as a statue to be wondered at from all sides, in its unique light, as it had been celebrated in antiquity, as some of the eighteenth-century artists tried to capture. Fig. 5.16 The Acropolis as seen from a distance by an arriving traveller, c.1800. Figure 5.17 shows how the entrance to the Acropolis appeared during the hundred years or so after an Ottoman refortification programme was completed sometime in the early eighteenth century until the changes brought about during the Revolution that began in 1821. Fig. 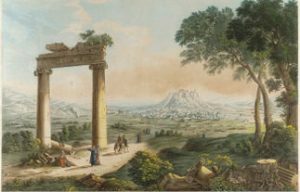 5.17 The Entrance to the Acropolis, Heinrich Hübsch, 1819. 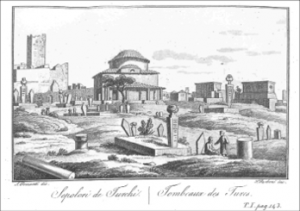 What was unignorable was the huge Muslim cemetery with its mosque that proclaimed to every viewer that Athens was part of the Ottoman dominions and had been inhabited by Muslims for four centuries – for as long as Europeans had been settled in North America. In the eighteenth century the Muslim population spoke Greek as their first language. Fig. 5.18 The Muslim cemetery at the entrance to the Acropolis. In my explorations in the area I have come across a few paving stones apparently made from Muslim tombs, but as part of the Hellenising agenda the cemetery was cleansed from sight, and from memory. In the long eighteenth century, unlike today, the Acropolis visually presented the continuity of its long past back to mythic times. But here I note two large differences between the experience of local viewers and that of visitors. For hundreds of years, hardly any of the Orthodox Christian community of Athens ever saw inside the Acropolis as it had been a closed military facility since at least the thirteenth century. By contrast, for visitors from western Europe, the desire to see the buildings on the summit was their main reason for being in Athens, and they could afford to pay to gain entrance to the site. The second big difference is the availability of expectation-setting mediating images. 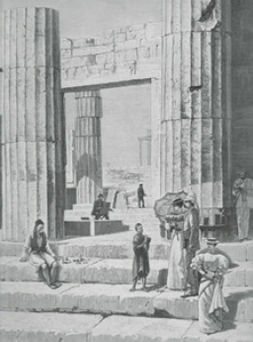 In 1835 shortly after the Acropolis was handed over to the newly independent Greek state, the authorities began to issue admission tickets, made by lithography. One was a map, the other a picturesque view. Fig. 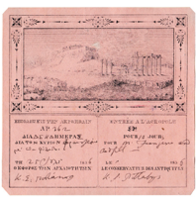 5.19 Admission tickets to the Acropolis, mid 1830s. 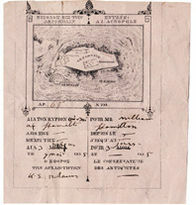 The map, that only notes the ancient buildings on the Acropolis, looks forward to the time when the town would be removed. The view, by including in its frame both a church and a camel train, keeps continuity. Figure 5.20 is an engraving of a bronze coin made in Athens during the Roman imperial period. Fig. 5.20 A low denomination bronze coin issued in Athens, Roman period, probably first century AD. That coin, catching the viewing experience of the ancient observer, picks out the ancient way up to the Acropolis, past the Cave of Pan, up the steps, and it shows the bronze statue of Athena Promachos, and a classical building – probably the Propylaia not the Parthenon, or maybe just a generic temple. For nearly two thousand years, from the time that this coin was struck until the tickets of 1835, I do not know of a single visual representation of the Acropolis produced locally. And by local I include the whole Byzantine and Ottoman territories. Yet are thy skies as blue, thy crags as wild;Sweet are thy groves, and verdant are thy fields,Thine olive ripe as when Minerva smiled,And still his honied wealth Hymettus yields. Athena’s owls still fluttered round the Acropolis. Every spring and autumn, almost to the day, the storks mysteriously came and went, building their nests on the monuments as shown in Figure 5.21. Fig. 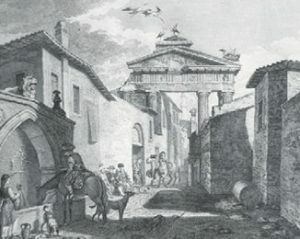 5.21 ‘A View of the Doric Portico at Athens in its present state’, c.1751. In ancient times an enclosed area of the Acropolis slopes had been called ‘the place of the storks’ (‘to pelargikon’) a verbal slide from ‘to pelasgikon’ (the place enclosed by the Pelasgians). It was a ‘storkade’, as one clever translator has put it, and we cannot fully understand ancient literature without reinserting the storks. For Enlightenment viewers, their acts of viewing, their makings of meanings, were attempts to use their imaginations to fill the gap between Nature, which they perceived as fixed, and the works of Man which were always changing. So the philosopher of history started with the storks. When wheeling high in formation in the sky, the storks had the panoptic view that the human viewer longed to share. The storks had stable government. The older storks looked after the younger ones, who, it was believed, cared for their parents. And in the eighteenth century any storks unable to fly to Africa spent the winter in the Ottoman governor’s garden which offered social care, free at point of delivery. Secure in their own little acropolises, generations of Athenian storks had observed the ups and downs of human history with indifference and condescension. But what were the laws of human history that were so different from the laws of Nature as practised by the storks? And how could they be discovered? The book that most helped to spread and entrench the philosophical way of seeing was The Ruins by Count Volney, his meditations on the ruins of empires, first published in French in 1788 on the eve of the French Revolution that he claimed to have predicted when looking at the ruins of Palmyra. As he wrote of his investigative method: ‘I will dwell in solitude amidst the ruins of cities: I will inquire of the monuments of antiquity what was the wisdom of former ages’. 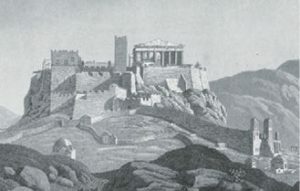 In the eighteenth century the Athenian Acropolis was uniquely well suited to the search for unifying theories. More even than Rome, it visually presented a continuous story. Far into the nineteenth century, despite the findings of science and scholarship, many histories start with ‘the Creation of the World’, as calculated from the biblical texts. They assume a providentialism that takes as given that the course of history is under a divine guidance that punishes as much as it saves. Many books play variations on Athens its Rise and Fall, Athens, Elevation and Decline, Athens, Grandeur and Decay. 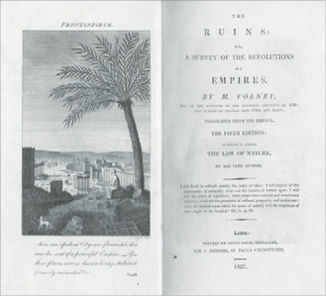 To individuals and to societies, the Acropolis visually presented lessons that were universal, exportable, and relevant to current public policy questions. Besides perambulating the Acropolis with eyes open, the philosopher therefore spent time reflecting on the totality of his or her experience, following the arguments, weighing the evidence, and fixing the lessons in his memory. The philosopher viewed the Acropolis with his eyes closed. Fig. 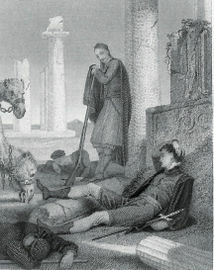 5.23 ‘Byron’s Dream’, 1819. But what were these lessons? To account for the achievement of Athens, many applied the theory developed by Hume, Montesquieu, de Staël, and some of the ancients, that the character of a people is an outcome of the natural environment. The Thebans were stupid, the ancients had said, because Boeotia was damp. Byron, picking up that tradition, noted that Lord Elgin came from Scotland, ‘a land of meanness, sophistry, and mist; /each breeze from foggy mount and marshy plain / Dilutes with drivel every drizzling brain’. But the climate of Athens is not always balmy, and its soil is rocky. It was Sparta, which has a more pleasant climate and a more productive soil, that had produced militarism. If the explanation for the achievement did not lie in Nature, it must lie in Man? So was it the institutions of the ancient Athenians that had led to their achievement, was their system of government, their commercial spirit, their democracy resting on a slave economy? But then what about the long decline? For help in meditating on that question, the philosophical viewer was visually assisted by the artistic conventions of the capriccio and the picturesque, and I show just one example of the images that were most frequently encountered at the time, rather than those commonly reproduced today. Fig. 5.24 ‘The Ruins of Athens’. 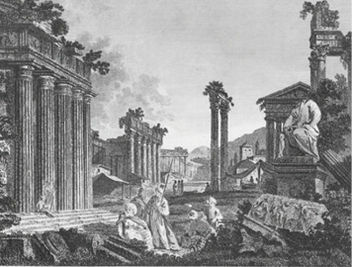 Textbooks for artists, including a few that advise on how to present Greek ruins, emphasised that accuracy was not important: the depiction of ruins must always have a moral aim. Viewers looking at these images were invited to ask themselves questions such as: why had Athens come to this? Had Athens been punished for its sins by divine providence? Like Sodom and Gomorrah, Nineveh and Tyre, Pompeii, and other ancient cities? And, if so, why had Athens been damned? Maybe too much luxury or free-thinking? And if Athens had it coming, then others had better look out too, as many warned. The explanation that carried most conviction to viewers from the west is that the failure must lie in the essential character of the people. The main early theorist of racism, Robert Knox, drew heavily upon the Acropolis, as shown in his book. Fig. 5.25 The Parthenon as a symbol of the superiority of the northern white races. With the invocation ‘wonderful and most mysterious race! divinest chapter in human history! unparalleled, unequalled, whence came ye? Whither have ye gone, fading away into the mists of the past?’ Knox, a medical anatomist, who assumed that ancient men and women looked like the ancient statues from the Parthenon that he had studied in the British Museum, uncritically reversing from icon to actual, declared that the Ancient Hellenes were a blue-eyed race directly akin to the modern Germans and Scandinavians. And across the Europeanised world the old idea that the genius of the ancient Hellenes was due to the natural environment merged with the new idea of essential racial differences. For example the Right Rev. J.A. McClymont, who provided what he probably assumed were uncontentious mainstream words to accompany the first popular book to employ colour in prints, remarked: ‘The inhabitants belonged to a good stock, the Indo-Germanic, while their geographical position and surroundings were well fitted to develop a high type of manhood’. And the line goes to Nazism, the German occupation of the Acropolis in 1941, and the systematic killing of those regarded as racially inferior. Fig. 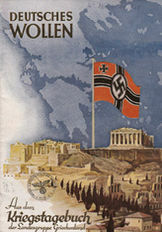 5.26 The German flag flying over the Acropolis, 1941. Nazi racial theories had many roots, of which the Acropolis was not the most important. But it is striking that while during the occupation, the Germans inflicted unspeakable suffering on the people, including mass executions, genocides of the Greek-Jewish community, enslavement, and the burning down of churches and monasteries, they made scarcely a scratch on the Hellenic monuments. Ernst Buschor, a famous professor, in a book published in Germany during the war, repeated the myth that the ancient Greeks were a Nordic people who had come from the north. In a little book, War in the age of the Parthenon that was given out to soldiers and students, he links their struggles to those between Hellenes and centaurs represented in the metopes of the Parthenon, that are indeed, in modern terms an aestheticisation of interracial violence. In a preface, Buschor makes explicit the German claim to be the new Hellenes by dedicating his book to the soldiers ‘who have died for the Great Hellenic heritage on the borders of the west’. Meanwhile, some viewers preferred to turn away from the Acropolis and look instead at the hill of the Areopagos nearby where, according to the author of The Acts of the Apostles, Paul had presented his ideas in a seminar of two of the Athenian philosophic schools. In this way of looking, the Areopagos was offered as an alternative – a superior – acropolis, and one which the early Christians had provided with its own mythic associations centred round Dionysius the Areopagite who is only known from one sentence in the Acts of the Apostles – but who was given a full biography, an iconic visage, and a large body of pseudonymous writings. The Areopagus is bare. The church and episcopal palace that had formerly stood there, had been destroyed at least once by earthquakes and rock falls, divine providence in this case punishing the Orthodox Christians. Instead, the Areopagus was reimagined as triumphing. Fig. 5.27 ‘Mars Hill, Athens’. There is a large body of texts of nineteenth-century, mainly western, Christian groups who compare the Acropolis unfavourably with the Areopagus, that is ancient Hellenism with Christianity. Some are fanatical, violent and triumphalist, others forgiving or trying to have it both ways. The counter-Acropolitans, as we can call them, were however united by their hostility to what the classical Acropolis represented, that they described, typically, as ‘the very citadel of Grecian paganism’ ‘all rank idolatry’. Their largely forgotten texts give us, I suggest, an insight into the range of reactions at the end of antiquity, a time when the contest between the values of ancient Hellenism was gradually being won by the incoming Christians, for which the surviving record is heavily weighted towards the point of view of the victorious theocrats. But before turning to Byzantium I want instead to return to another way of seeing invented in the eighteenth century, the aesthetic. Could it be, some asked, that the buildings of the Acropolis preserved some essence of Hellenism that was independent of their associations? The aesthetic way of viewing, unlike the philosophical, does not need active viewers. On the contrary, it claims to be an autonomous domain of meaning. The aesthetic, being immaterial, is exportable. By the end of the eighteenth century, Europe was already filled with new buildings modelled on the ancient buildings of Athens and North America followed. I show a picture by the architect James ‘Athenian’ Stuart, who did more than anyone to export aesthetic Hellenism. Fig. 5.28 The essence of the Athenian Acropolis exported to England. Stuart imagines the ancient architect Mnesikles showing his plans for the Propylaia to Pericles and the other famous men of the time. 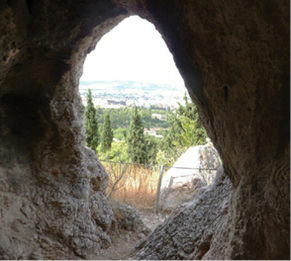 The Cave of Pan and the stairs up to the Acropolis – and the usual non-existent view of the Parthenon. The building on the right is a gentleman’s library. England, such buildings proclaim, has imported the essence of the classical Acropolis. Britain is the new Athens. And the style in which the ancient values were expressed could be copied. And it was a small step from exporting the incorporeal aesthetic to exporting the actual stones. It is this way of seeing, an attempt to separate the aesthetic from the historical and geographical context, that encourages the collecting of ‘unprovenanced’ antiquities, that continues to damage our ability, and that of future generations, to recover knowledge of the ancient world. Figure 5.29 reproduces a French lithograph showing Elgin that I only found a few years ago. Fig. 5.29 ‘Lord Elgin interrupts his meditations’. This illustration nicely captures a transition from the philosophical mode of viewing where the viewer’s experience is central, to the aesthetic notion that meaning can inhere in stones. Digging down deeper to the seventeenth century, we see that when the modern scientific on-the-spot study of the Acropolis began in the 1670s, much was immediately re-discovered about the ancient sites and buildings. Scholars from the west, unlike the local people of that time, had access to the printed works of the Leiden scholar, Johannes Van Meurs, known as Meursius, who, half a century before, had patiently collected and published all the references in the surviving works of the ancient authors that had been recovered and printed at the rime of the European Renaissance – a corpus not much enlarged since. And when we dig through to the local layers below the 1670s, we find a curious pattern. 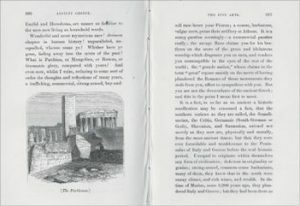 During the entirety of the period between the Christian takeover of the eastern empire at the end of antiquity and the encounter that began in the 1670s, not only are there no pictures of the Acropolis made locally in the whole Byzantine and Ottoman territories, but, in the vast surviving literature of Byzantium, mentions of Athens can be counted on the fingers of two hands. The three that can have any claim to represent local ways of seeing during the long millennium share some characteristics. The authors, or as we should perhaps call them, the story-tellers, know the names of some ancient Hellenic authors, but have no understanding of who they were or of what they wrote. They are all ‘philosophers’. Secondly, it is extremely difficult to date the time of composition from internal evidence, with some scholars putting the longest of the three texts as early as the ninth century and others as late as the seventeenth. The problem arises because they make little distinction between what still existed to be seen and what they say had once been there. In this running together of the see-able and the only imaginable, the stories are akin to the ‘meaningful history’ narratives now classified as post-colonial, that put first the perceived needs of their present. Like the nineteenth-century western Christian viewers of the Areopagus, they are secure in their triumphalism, and it is the places they associate with defeated ideas, notably the outdoor sites where the ancient philosophers held their meetings that they pay most attention to, not quite dancing on their graves, but picking out as ‘theatres and schools’, meaning, in the Greek, ‘things to be looked at and learned from’. Over a thousand years, a Christian theocracy monopolising education and art, had imposed a set of Christian myths on the ancient cityscape, on its buildings, and on its rituals. The long Akathist [‘not seated’] Hymn, that is still chanted in Orthodox Churches, composed long before it was adopted into ritual in 626, shows traces of the deep hatred of Hellenic Athens by the early Christians. In one passage, verse 17, not always now sung, the congregation collectively rejoice that their goddess, Mary, has triumphed over the ensnaring logic of the philosophers.] And there are other traces of this way of seeing. 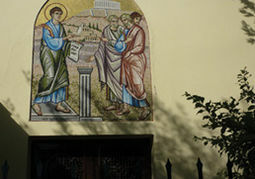 For example, the church of Saint Philip facing the Acropolis displays a modern image of the mythic visit of one of the disciples of Jesus to Athens where he was said to have confuted the arguments of the philosophers, as shown in Figure 5.30. Fig. 5.30 Confuting Hellenism. Mosaic on the church of Saint Philip facing the Acropolis. There is space for only a few remarks about how the Acropolis may have been viewed in antiquity – a long period of time but since viewing conventions were long-lived, some general points can, I suggest, be made. First, the ancient perception of the landscape and the cityscape was highly poetic, and so is the art in which landscape and cityscape were presented. Figure 5.31 shows a mosaic of which there are two versions both probably derived from a famous picture. Fig. 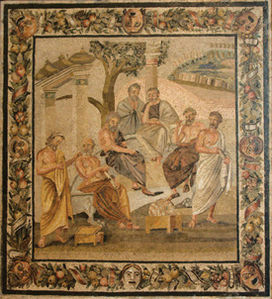 5.31 Mosaic of the Villa of Siminius Stephanus. It shows seven men, probably the Seven Sages, with their human scientific and artistic instruments. In the corner what appears to be a green-walled sanctuary, possibly Delphi or the Acropolis of Athens, is represented as it was encountered by the viewer, as a forest of marble dedications. The border of the mosaic, with gorgons and masks, is a common poetic representation of a physical natural border, like the Acropolis slopes. In ancient times, to judge from the authors, it was the Acropolis that provided the main interpretative frame, rather than any of the buildings such as the Parthenon. From Julian back to Homer, it is the Acropolis that is appealed to, whether to warn, to shame, to educate or to celebrate. And it is the whole visible Acropolis rock, slopes and summit, myth and history, the natural as much as the man-made. Memory slips away, but memory instantiated in marble, or in literature and ritual, has a better chance. To the ancient Athenians the aspiration was to create not an Eternal Greece, but an Eternal ‘Athenianness’, a history but especially also an expression of the values of the society, the famous notion of ‘paideia’. And as is made explicit by Aristides, this aspiration was achieved ‘by viewing and remembering’. As the site where the official memory and official values were preserved and displayed, the ancient Acropolis tolerated a good deal of alternative, even of contradiction, provided that it was filtered through the shared system of signs constituted by myth. We see none of that fear of art, and the urge to destroy it, to allow it to be used only for approved purposes, to keep it indoors, to allow two dimensions but not three, and to control both the production and consumption, that is such a feature of the long millennium of theocracy that followed. So what, if any, more general conclusions emerge from this brief summary of the long history of ways of looking at the Acropolis of Athens? As an embodiment of numerous, mostly incommensurate, imagined pasts and ideologies over thousands of years, it offers a uniquely full case for investigating the processes by which the past has been understood, misunderstood, misrepresented, claimed, mythologised, and presented and packaged for the current purposes within different societies. And how it can be drawn into an explanatory, but also often into an allegedly legitimating, relationship with the present and the future. In the richness of its retrievable historical experience, the Acropolis of Athens is an inheritance as precious as the marble. The read-across questions for those responsible for ancient and historic monuments round the world therefore come tumbling out. Which pasts deserve to be preserved? How should any current generation regard its responsibilities to its predecessors and its successors? Is it possible, or desirable, to recover the historically typical and not just the unusual? Should preference be given to what is now regarded as valuable, remembering that such judgments change, as the thousand years of hostility, indifference and neglect of the Acropolis vividly demonstrates? How far can those with responsibility offset the modern consumerism that treats the past as a resource to be exploited, for tourism, or for building a sense of community, such as nation or religion, and thus instilling a false view of the past driven by present day ideological objectives? Is there a legitimate place for ‘epistemic cooperation’, a phrase invented recently to describe an administrative process that ensures that archaeologists, lawyers, ‘heritage professionals’ and others have a right to be heard in the decision taking. Pragmatic solutions of this kind, however, that sidestep the competition between the truth claims, risk both slipping into relativism and enabling the loudest and politically most powerful voices to force their way. The dead have no rights nor do I suggest that they should be given any. Indeed much of our knowledge of ancient Hellas comes from excavating graves, setting aside the wishes of those who mourned and commemorated. However, I suggest, we owe it to ourselves and to our children to be as truthful as we can about the past. The Venice Charter was a commendable attempt to devise an inter-generational ethics aimed at saving the materiality of ancient buildings, based on notions of stewardship and respect for the autonomy of the past and of the future. In the modern west we have well-tried protocols for assessing the validity of research into the past, including into myth-making, of which evidence, openness, and free debate are amongst the most important. Perhaps, given the present threats, the time has come to build into that tradition a code of ethics for those who claim to make the mute stones speak? From Culture Heritage Ethics: Between Theory and Practice, originally published by Open Book Publishers (2014) under the terms of a Creative Commons Attribution 4.0 International license. This entry was posted in Greece, Greek. Bookmark the permalink.